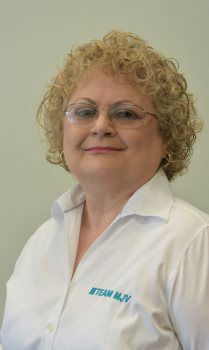 Personal: Lives in Bringhurst, IN, with her husband. They have one daughter and four wonderful grandchildren. Hobbies: Goldie enjoys photography, fishing, outdoors, reading, music and spending quality time with her family. • To continue to educate myself so that I can encourage others to be happy, have a positive life and work atmosphere. • To be a strong team support assistant for our team members and coaches to lean on when extra assistance is needed is . Zig Ziglar Goldie has worked in the corporate office of MJV since November 2004. Her duties include payroll, timekeeping, office administration and team member resources. Goldie has also assisted in several new account start-ups allowing her to gain valuable knowledge on how our company operates. Goldie’s extended studies include photography, computer science and art. She is a member of the National Poetry Society, winning the Editor’s Choice Award in 2000.